The main problems with the existing Peace Pentagon building are its bad condition, its lack of interaction with its surroundings, and its identity and income-generating strategy related to the main activities of the organization. The high cost of a renovation together with an inability to solve the problems of the existing structure and the need to fulfill the requirements of the residents make building a new building a more attractive solution. In response to the issues raised the new building has been programmed with the possibility of reimbursement of construction costs as well as future optimization of use. Placement on the building’s ground floor of any commercial spaces that are not associated with organization’s field of work would be a great mistake. 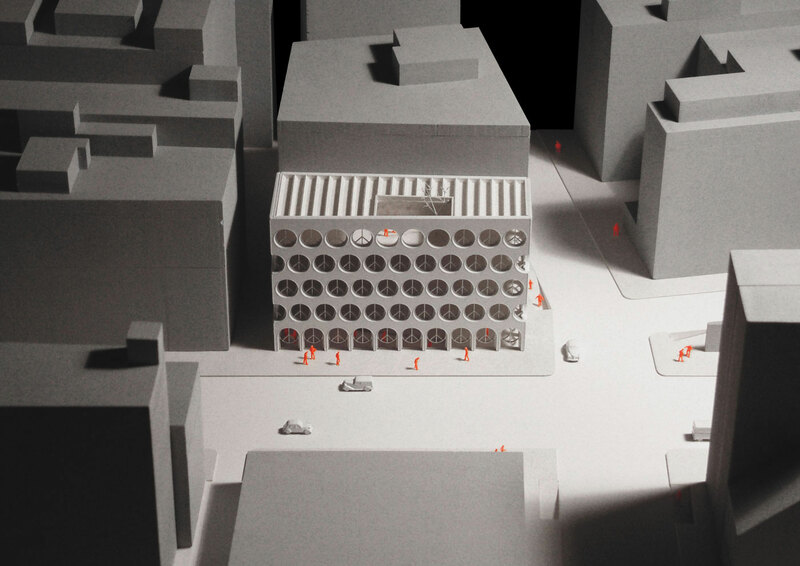 Taking advantage of the parcels’ location – vicinity to the Bleecker subway station and the large movement of people along Lafayette Street – the idea is to open and free the ground floor space and create a public connection with the subway station. This solution provides a multifunction space for thematic events and creates visual and life interaction with the outside space, encouraging the public to get into the theme of peace activism. Designed new public space in the building is defined as a thematic cafeteria (e.g. Peace Cafe). It becomes a stopover for the many people who want to commune with a spirit of peace, as well as for ordinary passers-by to exchange their views over a cup of coffee. The advantage of this space is the possibility it offers to organize special events like exhibitions, multimedia presentations, meetings, etc. that could operate in parallel or separately. In this way a new revenue generating strategy is established while maintaining focus on the Peace Pentagon’s main objectives. The idea of a characteristic and eye-catching facade is assumed to create a new and strong identity for the building. The transformed classic window frame together with white brick walls are to communicate to people a certain association with the building’s content. Thanks to a simple idea, we’ve avoided designing a fashionable and expensive second skin leaving the facade structural and genuine. The building is designed for efficient use of energy, water, and other resources. The photovoltaic and solar panels located on the roof provide an important source of electricity and heating. The use of simple, common and environmentally friendly materials (concrete structure, brick facade, wooden window frames) that can be manufactured locally minimize the cost and energy for transport. The reduced use of energy is also previewed by using additional thermal insulation, effective window size and placement, etc. A rainwater collector located under the -1 level provides non-potable water for use in toilets and for watering the plants on the patio.